Think Pink! 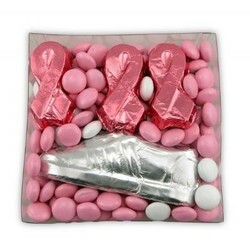 8.32 oz Clear box filled with 3 chocolate candy foil wrapped Breast Cancer Awareness ribbons, 1 chocolate candy foil wrapped tennis shoe and 6.4 oz of Colorific chocolate candy Bites (compare to M&M''s). Mix and match chocolate candy flavors and foil colors for no additional charge. Colorific chocolate candy Bites available in milk chocolate candy only. Coordinate ribbon to match corporate or theme colors. Price includes 4 color label on box. 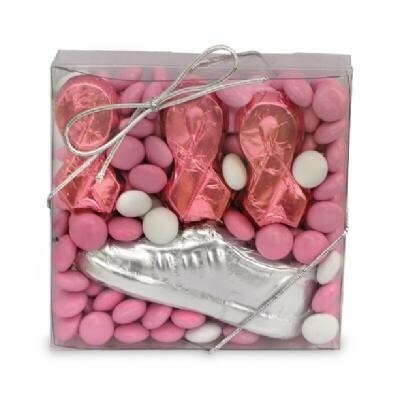 Makes a great food gift or breast cancer charity event run or walk promotional giveaway.